Happy September! Every year I try to give August a little more love, but I find I am still more than happy to usher it out like a house guest who's overstayed his welcome. I was excited to learn that the diabetes online community has designated September 1st as Diabetes Art Day. What better way to celebrate the flip of the calendar page than a day dedicated to healing through artistic/creative expression?! Art therapist Lee Ann Thill (a Type 1 diabetic herself) is the organizer and creator of this web based initiative. Her About page states that she "started Diabetes Art Day to encourage people with diabetes and their loved ones to utilize creative visual expression as a way of communicating their experience with diabetes, connecting with others, raising awareness, and promoting insight and positive coping skills." Awesome, huh? 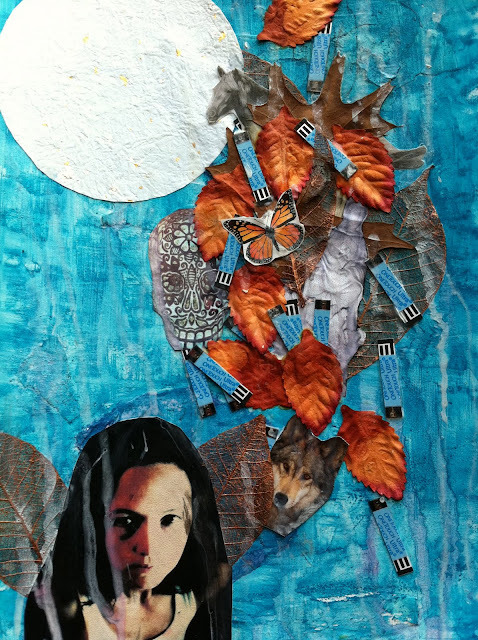 I decided the best way for me to tap into diabetes so specifically for this project was to create using the art journaling and SoulCollage approach: move intuitively around the page, going with images, colors, and materials as they come to mind, without overthinking or correcting. Working in this way allows me to be totally present in the moment, focused on color or image, yet when I'm finished, I find I've tapped into something deeper and more profound. In pondering the page and what I chose in those moments, often an insight into a difficult issue will emerge. It can be a powerful healing tool. And, all of this translates into something messy, gooey, kinda quirky, and totally me! I created the background using acrylic paint, torn paper, gesso, and a top layer of my beloved Caran D'Ache. I dumped out my purse and gathered some of those ever handy used blood testing strips. From there, I dipped into what I call my SoulCollage box, where I keep images cut from magazines, old calendars, newspapers, etc. I found that I was most drawn to animals that have in some way either physically and/or symbolically helped me cope with diabetes. Wolf speaks to me of the need for family and friends. He also symbolizes my instinctual self, that part of me that listens to my body and knows what is needed. Horse guides me past fear to freedom. She reminds me of the necessity of balance. Butterfly promises new beginnings. Something beautiful can emerge from the shadows. She offers hope. Several years ago, my husband gave me a statue of the Asian goddess of compassion and healing Quan Yin. It seemed only appropriate to include her in an exploration of my relationship to illness. The Day of the Dead skull is an acknowledgment of my fears. I believe that in honoring them it becomes easier to let them go. The moon connects all of these symbols, illuminating the path before me. And to make this collage complete, it seemed important to give myself wings. Thank you, Lee Ann for your hard work in bringing this event to the world!! Many blessings to the diabetes online community and to all of those who live with incurable illness. Never give up hope! what a beautiful way to honor the pain and fear, yet transforming it too... gorgeous healing art Angela!! wow...healing energy just vibrates from this piece! amazing. Wow. Three months after the fact, I've just now stumbled upon your blog with this AMAZING artwork. Outstanding work, Angela. I'm so bummed that I'd missed this months ago, but am so happy to have finally found it and have the experience now of knowing to follow your blog here! Looking forward to reading more soon, and keeping in touch through the blogosphere and ever-expanding DOC!